In TDM, you have to fake this effect with transparent particle, which takes more time to make, adds resources and needs more processing power. It would be great to have this effect only through post processing, as in image above. Edited by Judith, 24 September 2018 - 09:58 AM. I have no experience with UDK or other engines. Can you tell me more about the desired effect? What gets multiplied by what? So how is it different to e.g. regular material with the same "rgb 7"? In the UDK example, the glow goes beyond model boundaries. In idtech4 the lightbulb just goes white, there's no bigger glow. Edited by Judith, 24 September 2018 - 01:57 PM. So what are the rules for going beyond? And why the multiply? What is multiplied to what? The result is as in the first screen, first post. That bigger glow can be faked using the idtech 4 "flare" material, but is really not a post process Bloom shader like UDK is just a material trick, there's many different types of flares materials in Doom 3 because of that. Almost all Doom 3 flares have "_quadratic" has the map, so that must be important for the desired effect. Yes, I was about to post about deform flare too. The main limitation with that is that only rectangular surfaces can be transformed into flares. Edit: _quadratic gives a nice effect, but it isn't an absolute requirement. I used a couple of flare materials in In The Black, and one uses textures/darkmod/sfx/candleglow.tga instead. Edited by VanishedOne, 24 September 2018 - 02:29 PM. But that's adding another texture and material, which should not be necessary. We already have particles for that, but that's not optimal solution. 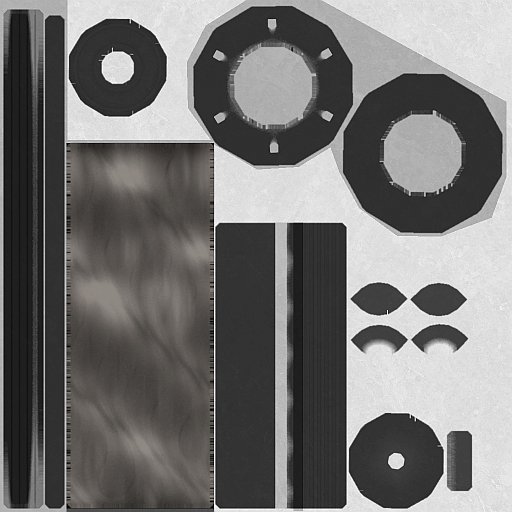 The point of this thread is to save on additional model, texture, and material drawcalls. How about making flare to apply to a single stage as well as the entire material? Probably not such a good idea. How about creating a custom shader for this? Can we have a test map for this? Yes a shader is a good idea, making a post process Bloom shader seems the best bet, in that way level designers don't need to make special geometry or materials for it, just make the texture bright and the Bloom shader does the rest. Build a translucent border that's always facing the viewer. This only works on quads (surfaces with 4 vertices). Used to make lens flares around lights. The parameter afterwards specifies the size. 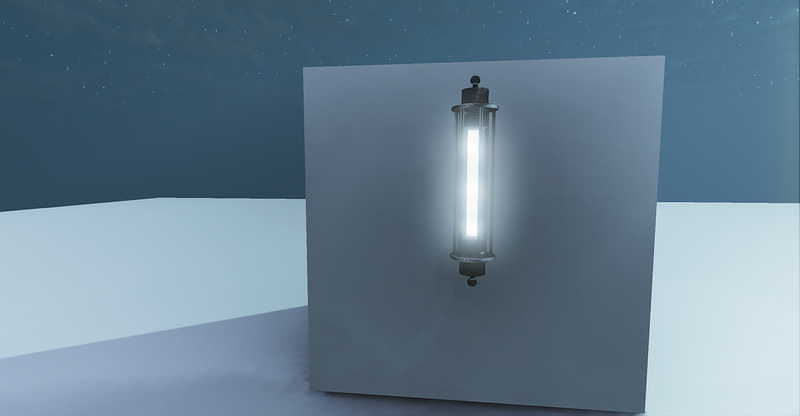 The map contains a simple room with two lamps, one model uses material with white emissive, the other uses orange one. Yes deform flare is the most important part and a requirement for the effect, and i know that the parameter afterwards specifies the flare size, i only refereed about _quadratic because even tho some don't use this keyword has a map, the majority of the Doom 3 flare materials do, so to me it indicated that was a important part in the overall look of the effect but not a required one. Flares are sprites/billboards, emissive materials are indeed shader driven. The deform keywords are simply used to always make the texture face the viewer without having it be a decal in-editor (at least IIRC). I've never worked with UDK but I recall that Dishonored had volumetric looking glow for their hanging lamps that doesn't suffer the same problems as our glare particles. 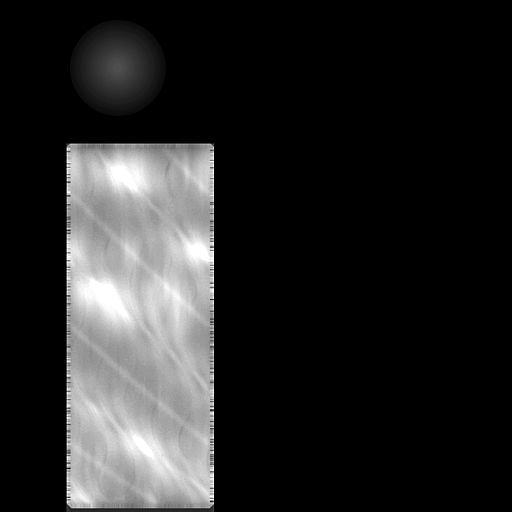 It might just be a nodraw model with an emissive material glow to fake volume. Tricks like this are what this would be most useful for, as our post processing already does a good enough job with bloom, esp. on 2.06. Emissive maps ought to be grayscale bitmaps with the shader handling them having some parameters like the spread of the glow (i'm thinking photoshop 'spread') and a strength value that doesn't modify the grayscale values of the map itself, so it won't just act like a Levels filter. e: yes, yes, Judith mentioned one of the test lamps had an orange emissive map, they should have some way to be colored, of course. Is allowing RGB images the best approach? That is a lot of data, but I suppose that can give you the most control (over tinting it in the material) if you're working on a set-piece model for something pagan, perhaps, so I correct myself on the grayscale part. Edited by Spooks, 25 September 2018 - 08:29 AM. Emissive maps can be RGB, both in idtech4 and UDK. But somehow idtech4 clamps these multiplied RGB values, while UDK uses them to blur the glow so it's around the model. Maybe it's what HMart says, the problem of the range and how idtech4 and Storm Engine 2 treats HDR. Can the SE2 code be of any help here? Looking at the engine I can see one problem with this. Every surface we draw ATM can be either solid, or translucent. The solid surfaces must always pass the equal depth test. The translucent surfaces never write to depth and must pass the "less than" depth test. Now the problem here is the engine forces the same equal/less depth test for all stages on a material. So we can either write to depth or post-process. Understandably, this lock would have to be broken to go forward with the emission material. I don't know if it this lock has been there since 2004 or it was added by someone from TDM. I'm not sure if it's time to break it now or not. Now, can't we achieve the same halo effect with a fog light? BTW please create a separate thread for volumetric lighting ( I can get sidetracked easily ) unless volumetric lighting and halos are the same thing. I think this is a postprocess issue, i.e. 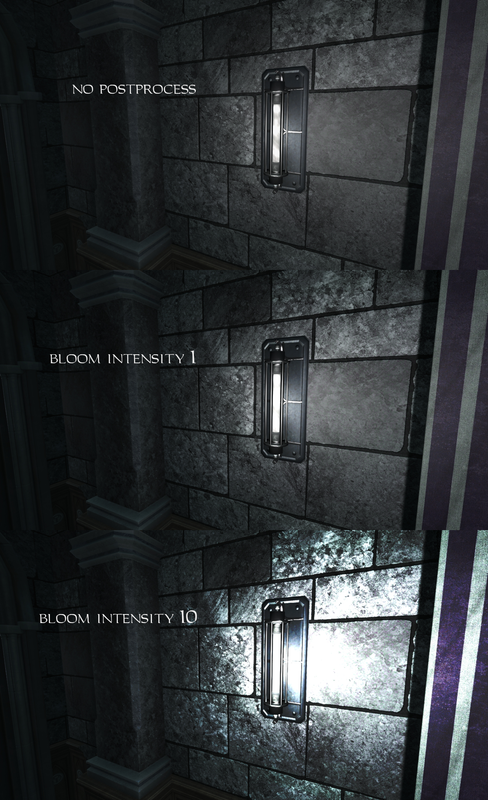 you can't get that bloom effect in UDK with postprocessing set to off. Since 2.07 is designed as stability release, this feature can easily wait until 2.08 or further. So, the halo materials went to the dusty closet. Practically we could start with a simple spherical highlight based on the @nbohr1more's link above. 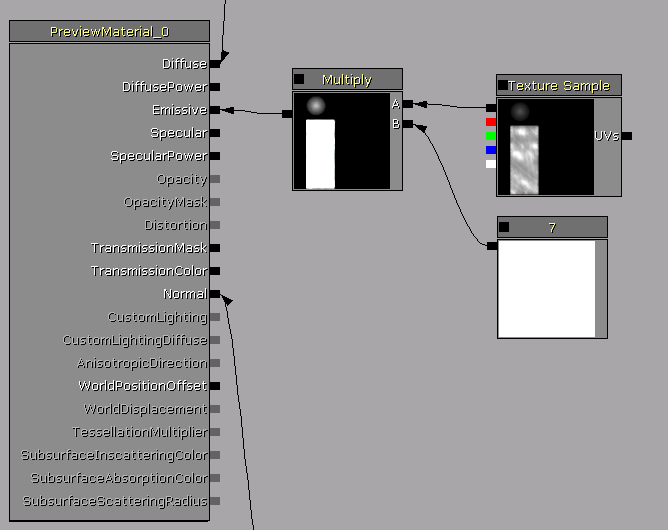 We only need to add a new parameter to the light material (you decide on the name). @Judith, can you update the test map to have custom light materials? Sure, will simple material be enough? Btw. AFAIK, volumetric lights are not cheap, performance-wise. It's a pity proper bloom is such a problem, as it's just a postprocess effect, and it's pretty cheap. Current solution with separate transparent texture and particle isn't cheap either.